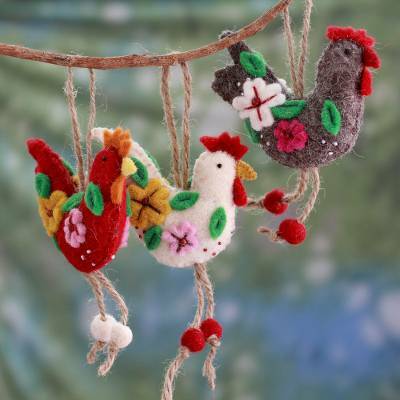 Handcrafted Wool Felt Ornaments from India (set of 3), "Three French Hens"
Rajesh Gehlot designs a handsome set of ornaments in the shape of festive hens. Each one is crafted by hand and decorated with glass beads. The ornaments hang from jute cords and arrive in a dainty pouch. Beautiful and well made. They will be cherished tree decorations for many Christmases to come.